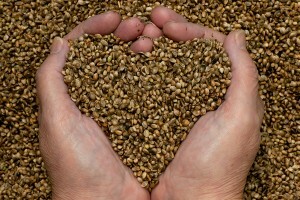 Why You Should Eat Raw Hemp Seeds Every Day, and 30 Recipes to Help You Do It! · Protein: Every 100g of hemp seed has 33g of protein, including the complete Amino Acid profile necessary for life and the function of our bodies. · Essential Fatty Acids (EFAs): Hemp seeds contain some of the highest amounts of Omega-3 and Omega-6, which helps boost our immune system, and keep our hail and nails shiny. Every 100g of hemp seeds has 47g of EFAs. · Phytosterols: Hemp seeds contain high amounts of cholesterol-fighting plant sterols, with 1480 mg present in only 20g of hemp seeds. · Conjugated Linoleic Acid (CLA): Hemp seeds have over 15 times as much of the fat-fighting acid as fish oil. · Low Carbohydrates: All of these benefits with only a ½ gram of sugar for every 20g serving of hemp seeds. It is incredibly important to eat raw, living foods. These foods contain enzymes, which are healing and sustaining to the liver. (and the liver has been deemed vital for our health and well-being for 5000 years of Chinese medicine). One of the many struggles with eating healthy foods is that it can be challenging to integrate items like hemp seeds into our diets, especially when we are new to using them. Smoothies and switching to hemp milk and hemp oils are great options, but what about actually creating meals with raw hemp seeds? Thankfully, there are people out there like natural medicine expert Brigitte Mars, who has authored dozens of books on nutrition for healing and wellness. I was fortunate enough to interview her last week on my new show Lucid Planet Radio, about how to use natural remedies to enhance our mental and emotional health. We had quite an interesting discussion, which can you listen to here. Enjoying granola raw preserves more of its vitamin E and B complex content. Soak almonds, walnuts, and pumpkin seeds overnight and rinse well. Add all ingredients to the food processor and blend. Mix blended ingredients into the nuts and pulse briefly. Spread on dehydrator sheets and dehydrate, occasionally breaking up large pieces into bite-sized morsels. Store in a glass jar. Mix all the ingredients together and store in a jar in the refrigerator. Makes about 4 1/2 cups. Options: Add 1/2 sliced ripe banana or 1/2 chopped peeled apple for a nutritious breakfast. Blend all the ingredients in the blender add the water gradually for three minutes. Makes 1 quart. A cool summer soup, or to add flair to any Latin inspired meal. Whiz all the ingredients through the blender (except the cucumber). Makes about 4 cups. Serve in bowls and garnish with slices of cucumber. I love that this delicious enzyme active rich soup can be made in about two minutes. This quick soup retains the nutrients of its vibrant vegetables. Place chopped asparagus in a large bowl. Puree remaining ingredients in the food processor. Pour over the asparagus and serve. Voila! Can be used to stuff peppers, tomatoes, top salads, served fresh, or dehydrated into veggie burgers. Put it all in the food processor and puree. Shape into burgers and top with grated vegetables. This has the flavor of a delicious Thai dish, but includes the enzymes and a wide variety of vegetables. Hemp seed adds protein and satisfying essential fatty acids. Mix all ingredients together in a bowl. Can top with some fresh or dried grated coconut or raw macadamia nuts. Here’s a lively twist on a Middle Eastern favorite. Process all the ingredients in a food processor. Form into flat two inch rounds. Dehydrate for 6 hours, turning when halfway done. This makes an all American dish something to feel good about. Blend together and reserve. .
1/4 cup each of sliced carrots, celery, zucchini, chopped spinach, pea pods. Place veggies in crust. Cover with sauce. Here’s a healthier low carbohydrate alternative to an Asian staple. Flax seeds are mildly laxative and like, Hemp seed, rich in Omega 3 fatty acids. These crackers are crunchy and can be used for dips and to make sandwiches. Soak flax seeds in spring water for 15 minutes. Stir in hemp seed. Spread onto three Teflex dehydrator sheets. Dehydrate for four hours. Remove Telex sheets and turn crackers over. Continue dehydrating till they are crisp. Keeps indefinitely several months. These round crackers make a wonderful accompaniment for Indian food. Or use them as tostadas to heap with chopped lettuce, sliced tomatoes and Guacamole! Mix all ingredients in a food processor/ Form into round shapes on Teflex dehydrator sheets. Dehydrate for 12 hours, turning after 6 hours and removing the Telex. Makes about 10 5-inch flatbreads. This Pesto is great and garlicky. It can be used as a dip or spread or topping. Purée everything in a blender. Served over zucchini pasta or raw kelp noodles. Serves 4-6. Bring this to your next potluck and everyone will be glad you showed up. With a fork mash the avocados and lemon or lime juice. Finely chop the onion and tomatoes and add to the avocados. Add the salt, Hemp seed and cilantro. Makes about 2 cups. Serve with raw vegetable slices, chips, crackers or use as a sandwich spread for flax crackers. Combine all ingredients into a mixing bowl and gently toss to mix. Refrigerate and serve, within a couple of hours. Makes about 2 1/2 cups. Mix all the ingredients together and allow to sit one half hour before serving. Serves 4. This makes a great party, snack, lunch or travel food. Put all of the above ingredients (except the nori) into a food processor. Cut nori into triangles (6 triangles to a sheet). Fill with pate. Cover with another triangle. Dehydrate overnight. Makes about 40 pyramids. Stores in the fridge for several weeks. Nuts can be flavored and made to taste roasted. This method preserves the enzymes and fat soluble vitamins of Hemp seed and other nuts. We bring a bag of this to the movies! Soak one cup each almonds, pecans, hazelnuts in water overnight. Rinse in the morning. Add 1 cup Hemp seed. In a blender, add 1 tablespoon olive oil, 1 teaspoon Nama Shoyu tamari, 1/2 teaspoon chili powder and blend. Use this to coat the nuts. Dehydrate 8-10 hours. It’s so easy to make your own mayonnaise. Powder hemp seed by grinding in the blender. Add water and lemon juice to the hemp seed and blend till smooth. With the blender running at low speed, gradually add the olive oil until thick. Add salt to taste. So much better than what comes out of a bottle! Blend together all the ingredients. Store in a glass jar and shake well before using. Makes about 2 cups. Hemp seed makes even salad dressing better! Blend together all the ingredients. Makes about 3 cups. Here’s a living vegan way to top your favorite foods. Mix together and use as a vegetable, bread or pasta topping. End your meal with a treat so rich that leaves you feeling light and supercharged. Process in food processor. Press into a pie pan. Company coming? Someone’s birthday? Show you really care by serving a cake that’s a cut above the ordinary. 2 cups raw carob or cacao powder. Puree everything in the food processor. Divide into four round layers and dehydrate overnight on Teflex sheets. Turn and dehydrate another two hours. What good is a cake, if you can’t eat it? Blend all the ingredients in the blender. To color frosting pink, add 2 tablespoons beet powder. To color frosting green, add the ingredients of 2 chlorophyll capsules – without the gel cap. I like Chlorofresh™ by Nature’s Way. Share with friends and family when you think you want fudge. In a large bowl, put the 1 cup of the hemp seed as well as the pumpkin seeds, carob or chocolate powder, bee pollen, cinnamon, cardamom and raisins. In a separate bowl put all the other ingredients, except the remaining 1/2 cup Hemp seed and mix well. Now mix the 2 bowls of wet and dry ingredients (except for the Hemp seed) together and stir. Form into 1/2 inch diameter balls with your fingers and roll each ball into the remaining Hemp seed. Store in the refrigerator. Dessert can be a treat without compromising your standards of health and excellence! Place all the ingredients in a food processor except the berries. Purée. Stir in berries. Serve in bowls. Can garnish with a sprig of fresh mint or edible flowers. Two of the planet’s most divine fruits combined in a sugar free, dairy free knock-your socks-off ice cream. Place above ingredients in a blender. Then process in an ice cream making machine. Make a coating by mixing the hot water, chocolate or carob powder and honey to make a paste that is neither too thick or thin. Insert a popsicle stick into each banana half and dip into the syrup and coat completely. Then roll them in the Hemp seed. Place on wax paper and freeze. Eat while still frozen. For more raw food awesomeness, visit Brigitte Mars online and check out her new book, The Home Reference to Holistic Health and Healing, and her new app, iPlant.